The Wrapper System is a tool in your IDX Broker account that applies your website design to your IDX Broker pages. The IDX Broker data and pages are hosted on our servers and come with minimal styling until they are "wrapped" with the look and layout of your website. Typically, when a new IDX Broker account is set up, a static wrapper is created from the website you provide us so that your pages are ready to integrate. The Static Wrapper is built using HTML and is a "snapshot" of the source code from a page on your website and is called static because it does not update on its own. This means that each time your website design and/or navigation is updated your static wrapper will also need to be updated to match those changes. To update your static wrapper, you or your designer will need to be familiar with HTML. 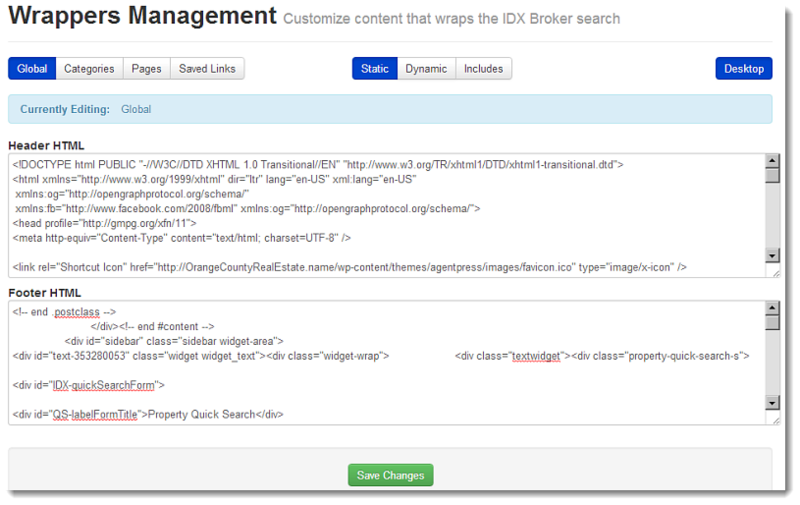 If you are not familiar with HTML the IDX Broker Support Team can update the wrapper for you, and provides two free wrapper updates a year. Choose a page from your website upon which you would like to pattern your wrapper. The graphics and layout of this page (except the inner content) will be duplicated for your IDX Pages. Use your web browser to view the source code for that page. Copy all of the source code, and paste it into an HTML editor like Dreamweaver or EditPad Lite or Notepad ++. Relative URLs point to a file hosted on the same web server in the same directory as the present page you are viewing. They typically start with a / and can look like "/index.html" or even "/files/theme/redhouse/images/headers/lakeside.jpg"
A relative link will point to a file that is hosted on the same web server in the same directory as the file you are currently editing. Relative URL paths in your website will work when viewing the non IDX portion of the website, but will not find anything when viewed from an IDX page because the IDX pages are hosted on a different web server. In the IDX Control Panel, go to Design -> Website -> Wrappers. Choose which wrapper you would like to work with, Global, Categories, Pages, or Saved Links, and choose Static as the type of wrapper. On this screen, you will see two areas labeled Header HTML and Footer HTML. Go back to your HTML editor and copy everything above your <!--Split Here--> comment, and paste it into the Header HTML section in your IDX control panel. Copy everything below your <!--Split Here--> comment, and paste it into the Footer HTML section.